Content Discovery Networks are nothing new, but if you haven’t heard of them then I’m almost certain you will have seen them around the web. Often they’ll have a titles such as ‘More like this’ or ‘From Around the Web’. They house a number of articles, usually at the bottom of a blog or article that direct traffic to (mostly) external websites. But how do they work and are they worth the time, effort and budget? 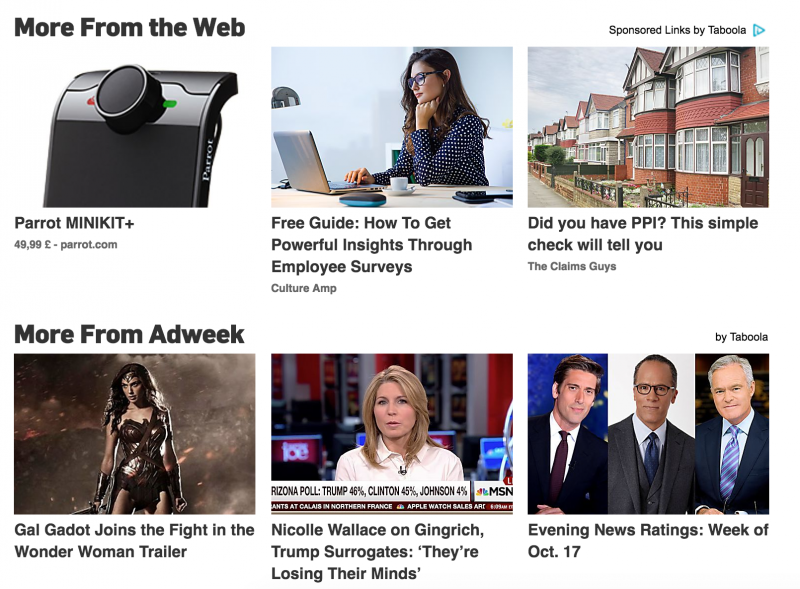 Are Content Discovery Networks Native Advertising? So by this definition there are many logical arguments that state Search Ads, Social Ads, YouTube Ads and a whole other host of paid forms of advertising are technically native. this article gives a good insight into native as a whole. I’m very much on the fence as to whether Content Discovery Networks are truly native. They’re less intrusive than a banner or social ad and it’s natural to funnel users to other content. But on the other hand it’s still a form of paid advertising that sits (usually) at the bottom of an article where a display ad may usually sit. However until proven otherwise, they will be classed as native. Content Discovery Networks work by displaying your content across its large network of websites (and apps). Large, respectable sites such as CNN, ESPN, and Mashable are just a small sample of some of the sites that content can be displayed on. 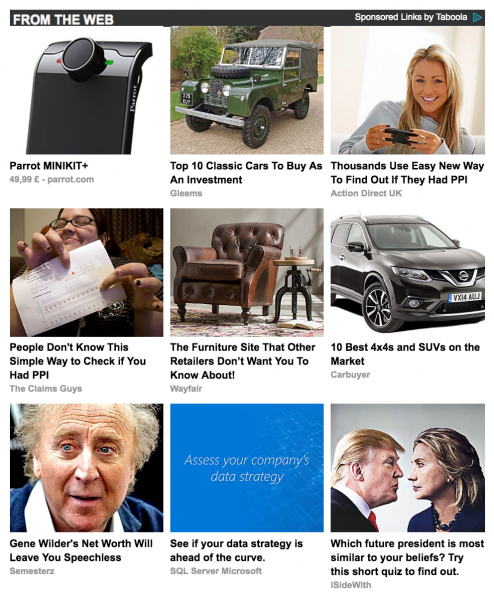 There are a number of platforms that do this, but two of the most popular are Taboola and Outbrain. They’re PPC platforms so like many other ad formats, you only pay when someone clicks on your content. Maximum bids and budgets can be set, and campaigns can be started from just $10 a day (on Outbrain). There are some basic targeting options available such as location and device type, but there are also some other new advanced options such as retargeting (I’ll get to that in more detail later). But what makes Content Discovery Networks interesting is that (not surprisingly given the name) the platforms are principally designed for content and not ads. Below is a graphic that shows what Outbrain will allow and not allow to be displayed. They’re designed so pages are not allowed to be sales heavy, and are actually looking to provide a user to have a good experience. This should really stand out to content marketers and make it a great tool to get eyeballs on content. But unfortunately they’re as perfect as they seem. Isn’t it just always used for clickbait? This is unfortunately, what I think is the biggest issue for the platforms. Because there is the ability to advertise very broadly on a mass scale, for the most part they have been overrun with click bait articles (I’ve previously voiced my strong dislike for clickbait). For me, this has devalued them as a form of getting eyes on content. People don’t like clickbait and Content s now unfortunately seem synonymous with it. This could well have created a ‘banner blindness’ effect with them, where people know that content isn’t going to be relevant so ignore them completely. They’re getting a lot, lot better. Out of the results below, 5 of these are actually pretty relevant for me when considering my recent browsing behaviour and interests. Result 8: I can’t say anything in particular but as a marketing manager for a digital marketing agency, this is pretty relevant. There are still 4 garbage pieces of content, but there is a definite improvement in the type of content that are being displayed. These relevant results are likely due to recent improvements in targeting. The above are slightly restricted due to geographical locations, but there is also the possibility to use first party data (Outbrain call this Custom Audiences). This allows user to retarget users and assign different CPCs based on behaviour and value. We already know how well retargeting works through traditional PPC channels, so retargeting content is a great tool to have in the arsenal. In addition to the data targeting abilities, context of the articles are also taken into account. This means that content is much more likely to be displayed on relevant websites to a more relevant audience. These are some stats for a brand awareness campaign we ran for one healthcare client. Now I have to admit that it’s not as one sided against Twitter as it first appears. Half way through the campaign, the Taboola traffic was performing so well that we transferred all the budget designated for social over to Taboola (the total budget spend was around $2000). This was a brand awareness campaign so was measured on relevant KPIs, but the Taboola traffic even brought in a few eCommerce conversions which was a real bonus. Here are some more stats straight out of the dashboard. For a brand awareness campaign, these are pretty good figures. The CTR is low, but the CPC is too. This was pre-brexit so 25 cents translates to around 17p a click. That is considerably lower than social traffic. Should I use Content Discovery Networks to promote my content? If you’re looking for sales or leads, then it’s unlikely that the platform is going to provide a tangible ROI. However if the main goal is wanting eyeballs on content for a brand awareness campaign, then Content Discovery Networks could be a platform to investigate. The first one is simple. They’re are still very full with click-bait and nonsense articles. While I’ve argued that this is getting better, it may not be great to have your brand associated alongside untrustworthy content. Secondly, I’m not convinced that Content Discovery Networks are as suitable as other paid advertising options (social, adwords, display etc.) for a number of industries. I’ve shown an example where it’s worked really well. However this was a broad campaign subject that would be of interest to a lot of women. I think that they will work better for brands with mass market product or broad appeals. For something far more niche or B2B, I’m not quite sure it’ll have the same effect. However, as the Content Discovery Networks start building up more accurate targeting options, they could well be a promising tactic for marketing campaigns and I can see them being much more prominent in the very near future. We have content for a pretty small niche and really need to target by Occupation. I know Facebook can do it, and LiveIntent. But I just signed up for Taboola and can’t find ANY targeting options beyond GEO and Device. Same with Outbrain. Do you have any insight into this? Any true native content platforms that publishers are using, which do include 3rd party data and targeting by Occupation?